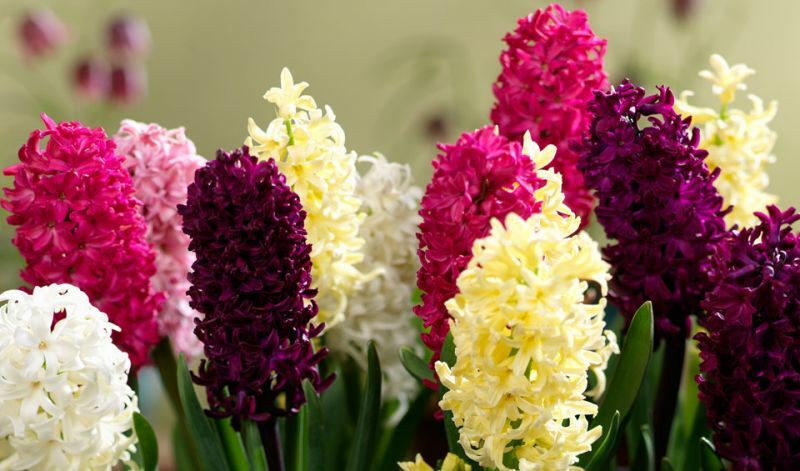 Hyacinths are extremely popular because of their absolutely delightful fragrance. Plant them close to your front- and back-doors so you can smell them often during the Spring. They are very easy to grow, also indoors on pots or special hyacinths glasses, and come in a multitude of fantastic colors. When Will This Flower Bloom? When Should I Buy and Plant These Bulbs? What Kind of Light Does This Bulb Prefer? What Color Will the Flower Be? How Far Apart Should I Plant These Bulbs? How Deep Should I Dig? How Tall Will It Grow? Recommended Number of Bulbs Per Square Foot? How Can I Best Use It in My Landscaping? In flower beds, borders and for indoor forcing. What Should I Do After Flowering? Apply some bulb food just as the new growing shoots start to appear in Spring. Deadheading after flowering prevents the formation of seedpods that divert energy from replenishing the bulb for next year's flower. To deadhead hyacinths, remove all the florets form the main flower stem as soon as they begin to look weary and before they totally dry. With one hand, loosely grasp the stem below the lowest florets. With the other hand, gently pull up along the stem to remove the florets. Then split the stem and open it flat: it will turn into the biggest leaf and will further help to re-energize the bulb. In subsequent years the flower will not be as dense and large as the first year. If you don't like the looser, longer more open flowers plan to dig up your bulbs after 2 or 3 years and replant new bulbs in the Fall. BLUE; 'Atlantic', 'Blue Jacket', 'Delft Blue', 'Peter Stuyvesant'. MAUVE-VIOLET; 'Amethyst', 'Anna Liza', 'Splendid Cornelia'. RED; 'Jan Bos', 'Hollyhock'. PINK; 'Anne Marie', 'Fondant', 'Pink Pearl'. YELLOW; 'City of Haarlem'. ORANGE; 'Gypsy Queen'. WHITE; 'Carnegie', 'White Pearl'. Native to the Eastern Mediterranean region, west Iran and Turkmenistan.